Southern’s Jarrett Hupp follows through on an approach shot in front of Eastern’s Jasiah Brewer, during a Sept. 5 TVC Hocking match at Riverside Golf Club in Mason, W.Va.
McDERMOTT, Ohio — All good things must come to an end. 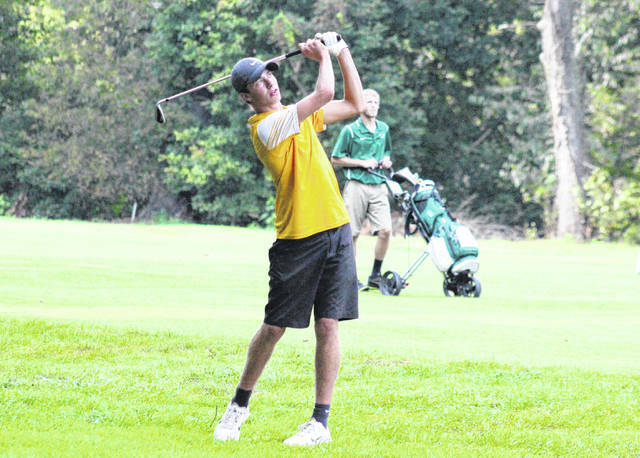 The Southern and Eastern golf teams — co-champions of the Tri-Valley Conference Hocking Division — both teed it up for the final time this fall in in the Division III Southeast District tournament at Elks Country Club in Scioto County on Monday. With just one team and one individual who is not on that team moving on to the state tournament, Crooksville took the team championship with a 333, five strokes ahead of second-place Manchester and 11 strokes ahead of third-place West Union. Western senior Elias Montgomery earned district medalist honors with a five-over par 77, one stroke ahead of the nearest competitor, Crooksville’s Brock White. The Tornadoes — who in addition to sharing the league’s regular season crown with the Eagles, also won the TVC Hocking one-day tournament for the second straight year — finished fourth in the district with a 352 in the play five, count four format. The Tornadoes were led by the senior duo of Jensen Anderson and Jarrett Hupp, who tied for the 12th-best round of the tournament with 12-over par 84s. Fellow SHS senior Ryan Acree was next for the Tornadoes with a 91, followed by Landen Hill with a 93. Joey Weaver recorded a 99 as the Tornadoes’ fifth score. Eastern counted scores from a quartet of seniors and took fifth in the district with a score of 367, 15 stokes behind Southern and 15 stroke ahead of Whiteoak in sixth. Jasiah Brewer led the Eagles with a 14-over par 86, the 17th-best round of the day. Ryan Harbour and John Harris each scored 92, while Kylee Tolliver came in with a 97. Nick Durst contributed a 101 as Eastern’s fifth score. South Webster and Southeastern both had four-man totals of 383, with the Jeeps earning a three-stroke edge on the fifth-score tie-breaker. North Adams and Waterford rounded out the team standings with scores of 387 and 395 respectively.